Often it’s not until you have time to think about and reflect on a new idea or concept that you understand the material and how it relates to the class. Self reflection is also a valuable tool to evaluate your achievements and progress though a course. To help you organize your thoughts and reflections, your instructor might ask you to keep a Journal. 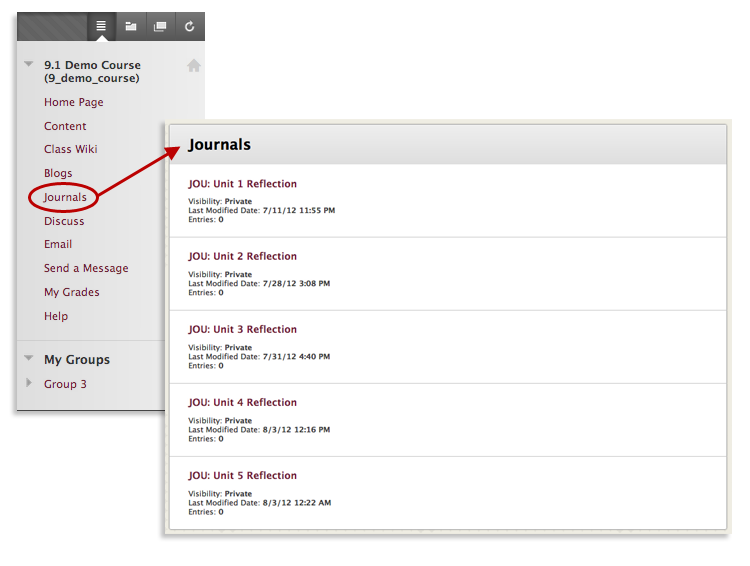 Journals in Blackboard are a way for you to communicate your personal thoughts and reflections with your instructor. In addition, a journal can help you track your progress and give you a way to see how much you have learned. It can also help you decide where you need to concentrate more. See an overview about how to use the Journal tool. Journals are a personal space for you to communicate privately with your instructor. You can also use a journal as a self-reflective tool to post your opinions, ideas, and concerns about the course, or discuss and analyze course related materials. For example, you can describe problems faced and how you solved them. Your instructor can direct journal entries to be more formal in nature and narrower in focus by listing topics for discussion. 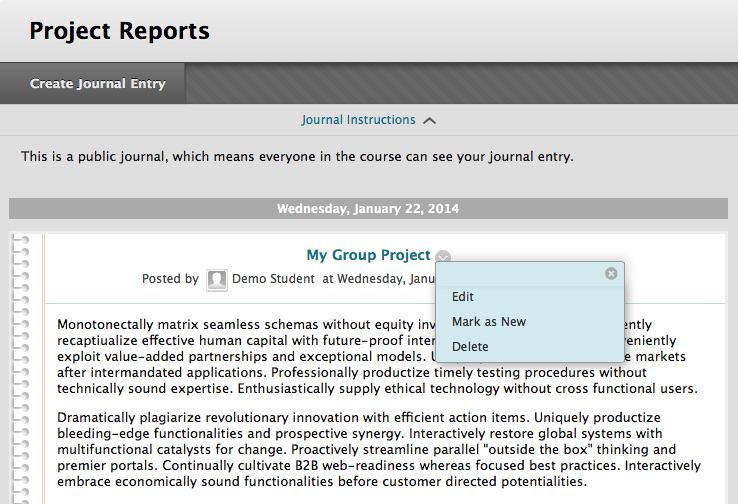 Your instructor can choose to make journal entries public, allowing all course members to view all entries. One example of making entries public might be if your instructor wants opinions on how to improve the evaluation process. You can read what other students wrote and build upon those ideas. 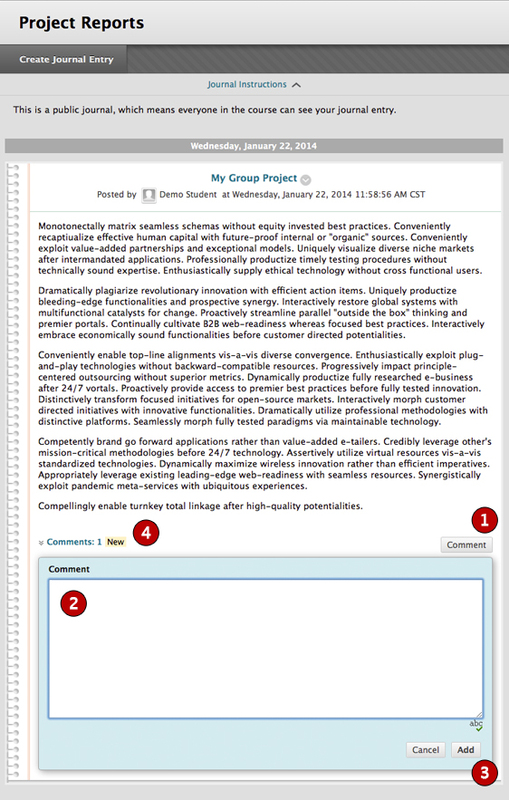 When used in the Group area, members of a Group can view and comment on each other’s entries for a Group journal. The Group can communicate with the instructor as a whole and all members can benefit from the comments made. By default, Journals are set to private. Instructors can change this setting to public, which means that other students can see your Journal, but cannot comment on it. You can only access the Journal tool from within a course. To access the journal tool, click on the link on the Course Menu. Your instructor may also include a link to the journal tool inside your course’s content areas (i.e. Learning Modules, Content Folders, etc.). You can identify Journals by the icon located to the left of their titles. If the instructor links to the Journal from the course menu, the name of the journal link may be unique to the course. You’ll know you are on the journal list page because it will say Journal at the top. A list of journals appears on the Journal list page. 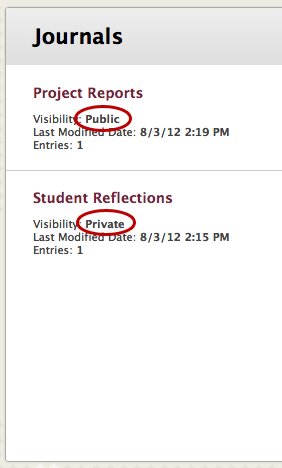 You can see if your entries are private or public. Your instructor will create journal topics that you will use to make entries. 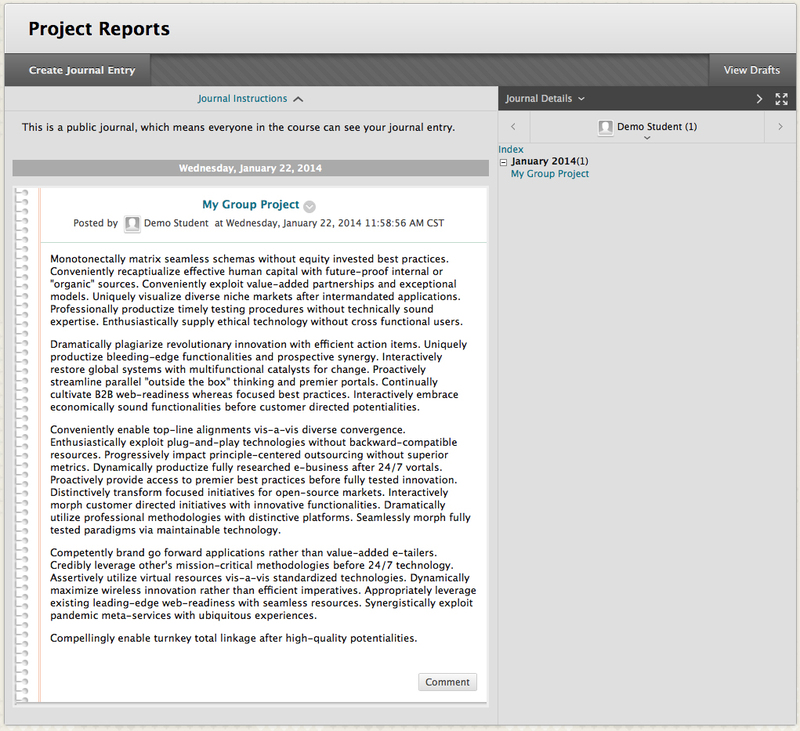 The Journal Topic page is divided into two main sections. You can view the Instructions in the content frame at the top. Click the X to collapse the field. In the side panel, you can view information about the Journal. Any entries saved as drafts can be accessed by clicking View Drafts on the Action Bar. Give your journal entry a Title. Type text in the Entry Message text box. You can format the text and add images, links, multimedia, and Mashups. You can attach files using the Attach File buttons beneath the message area. Journaling is an interaction between you and your instructor. You can build rapport and create a vibrant intellectual exchange with your instructor by sharing a journal. You can make a comment after your instructor comments on an entry to continue the conversation. You cannot make comments on another student’s journal entry, even if the journal has been made public. Students can only comment on another student’s entry when they are members of a Group. For Group Journals, all Group members and the instructor are allowed to make comments on individual entries. Type your comments in the Comment text box. You can Spell Check using the button at the bottom of the Comment box. View your comment by clicking the Comment link at the bottom of the Journal entry. You can edit and delete your journal entries if your instructor allows it. However, if you edit or delete gradable journal entries, the original graded entry will be lost. 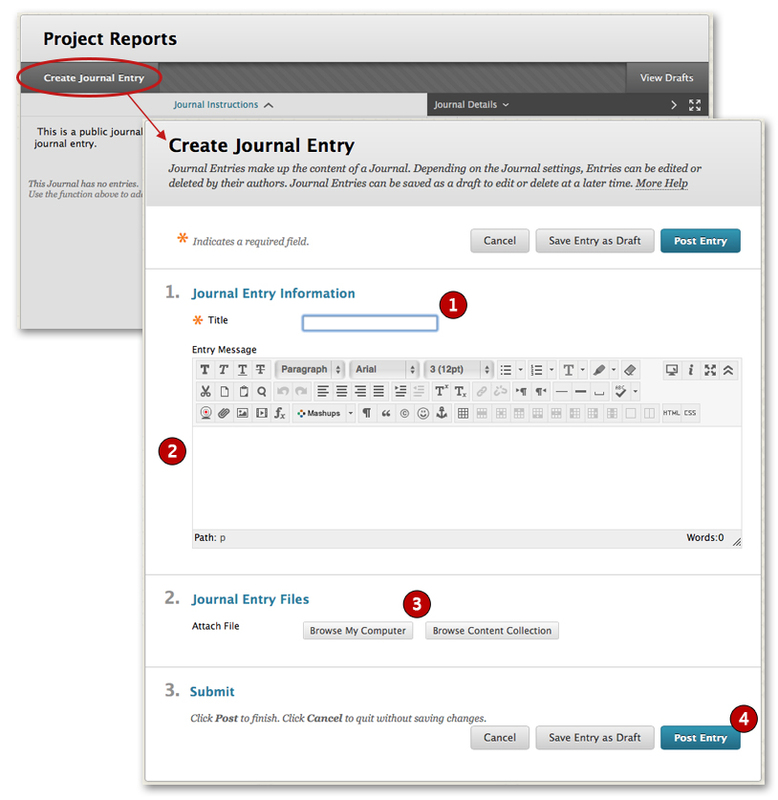 To edit or delete a journal entry, access the Journal entry you want to edit. On the Journal’s topic page, click the entry’s Action Link to access the contextual menu. Select Edit. On the Edit Journal Entry page, make your changes. Click Post Entry. To delete an entry, select Delete from the contextual menu and then click OK.
Once individual Journal entries have been graded, you can view your grade in two places. 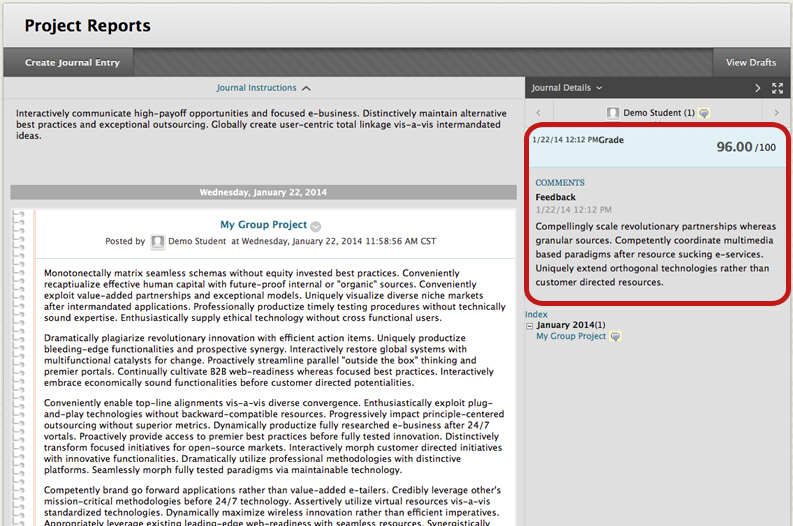 The grading information appears on the Journal topic page and in the My Grades tool.